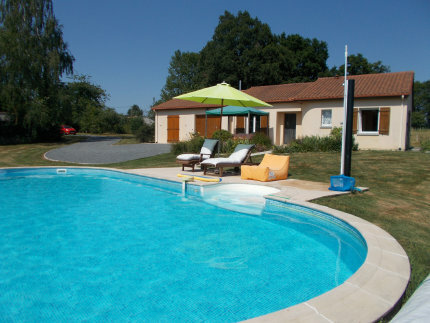 We had a really lovely time with them, taking them out to our fave restaurant, testing out the new bar that opened in Darnac, but mostly chilling out at home, soaking in that pool and catching up on years of family gossip. 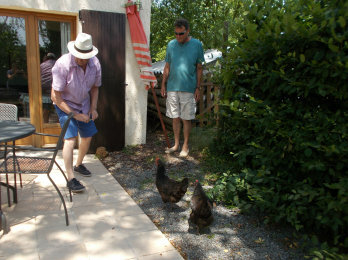 They love our free range chickens - everyone loves the chickens - and fed them breadcrumbs and scraps when they came calling at the gite. Mike and Sue had a great time and promised not to leave it so long before their next visit. Good! 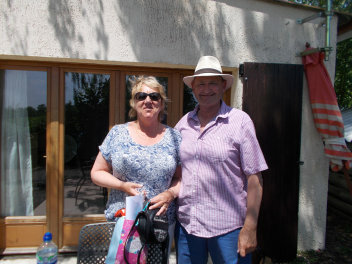 We had a short-notice vacancy when a pencilled-in guest change their mind so Tony phoned his older brother Mike and invited him and his wife Sue to come and have a few days with us. It came at an opportune time when they really needed a break from the painful process of trying to buy a house. Our silk tree is magnificent in bloom. 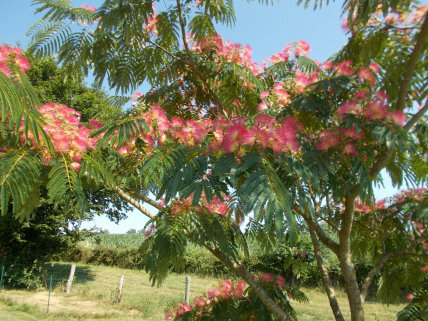 It's flowers are just so exotic, pink and fluffy, what an impressive tree. A ladybird on every frond ... the bugs just love it. 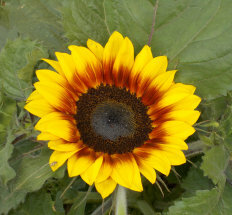 Tony planted sunflowers among the tomato plants, for cut flowers. But they're so gorgeous I can't bring myself to cut them. Instead they provide a brilliant show of happy faces in the veggie patch, visible from the pool area.